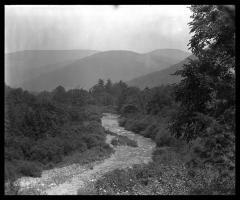 View of Esopus Creek near Big Indian in Shandaken, Ulster County in the Catskill Mountains. The view is to the north with Rose Mountain on the right. A "Summit Mountain" is said to be on the left, but there is today no Summit Mountain in the area; this would have to be either Balsam Mountain or Belle Ayr Mountain. This image was created to record the Catskill forest-related activities of the New York State Conservation Commission.